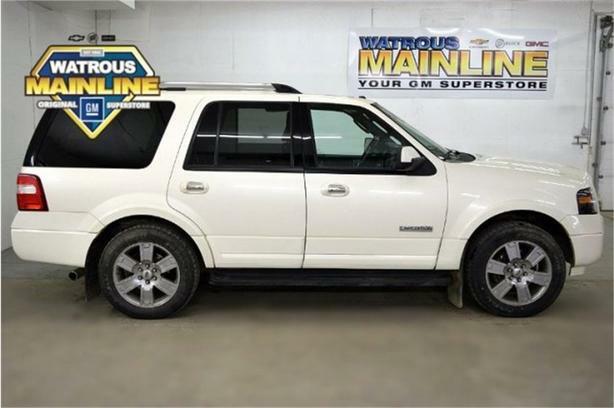 Check out this 2008 Ford Expedition Limited. Its Automatic transmission and Gas V8 5.4L/330 engine will keep you going. This Ford Expedition features the following options: 4-wheel anti-lock braking system (ABS), Wood & colour-keyed leather-wrapped steering wheel-inc: climate controls, speed controls, audio controls, Warning lights-inc: safety belts, anti-lock brakes, speed control, engine check, charge system, air bag, fuel cap, low washer fluid, O/D off, Variable-assist pwr rack & pinion steering, Universal garage door opener, Tire Pressure Monitoring System, Tilt steering column, Speed control, Solar-tinted glass w/rear quarter privacy glass, and SIRIUS satellite radio. See it for yourself at Watrous Mainline Motor Products Ltd, 208 1st Avenue East Box 70, Watrous, SK S0K 4T0.